Here are the ideal poppers for theatre or your home theatre experience. Our popcorn machine features 3 oz or 8 oz stainless steel kettle, tempred glass windows, twin arm kettle suspension and removable kettle. Easy to operate and clean,eye catching. Table top design and popper make carter design are available with different color combinations. Except model GC906 and GC908 popcorn makers have heat lamps for warming. 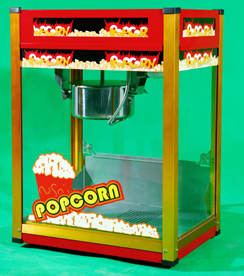 All other popcorn machine offer heated popcorn deck, this helps popcorn that has already been popped stay warm until it is served. 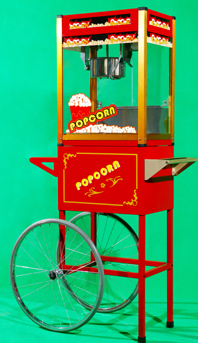 Our popcorn makers can be plugged into any household electrical outlet.